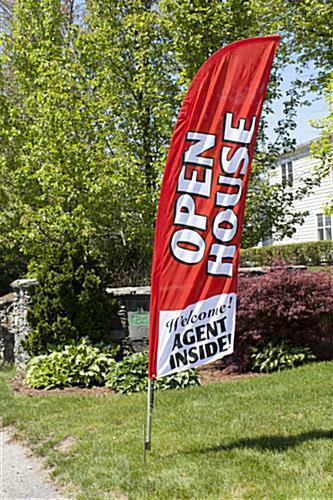 The Open House Message Flag Will Make Any Showing a Success! A Ground Spike Base Is Included! This Open House Message Flag Also Comes with a Carrying Case! Open House Message Flag Says "OPEN HOUSE, WELCOME! AGENT INSIDE!" This open house message flag, also known as a blade banner, features a design that ensures potential property buyers know a home is for sale! Individuals in a passing card or down the street can quickly read the bold white text on the red backdrop. 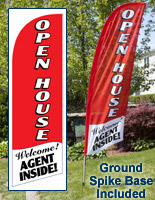 The red open house message flag also has "Welcome! AGENT INSIDE!" in black font on white, under the vertically oriented main text. The combination of the two statements will clearly communicate that guests are welcome to come into the property and look around to gauge their interest. The fabric of each open house message flag that is red consists of a knitted polyester for use outdoors. Measuring 24"w x 72"h, the feather banner is large enough to create an impressive display, yet small enough only one person is needed for set up. 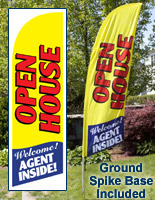 The open house flag that is portable comes with an aluminum and fiberglass pole. 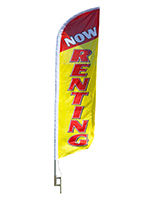 Aluminum flagpole components make these blade banners affordable and easier to set up. The fiberglass flagpole pieces allow the open house message flag to bow in the wind to the same extent that other blade banner displays do. Usually, real estate agents are advertising a different property every week, if not every day. 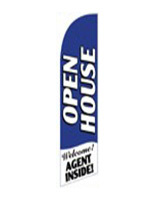 This real estate advertising banner is an open house message flag that is portable specifically so realtors can quickly set the unit up, take it down, then place it in the trunk of their car for transport to the next showing. 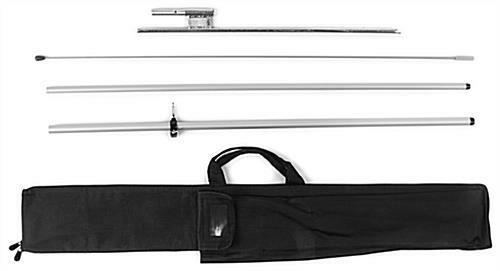 Flagpoles come in four separate sections that assemble in less than a minute! 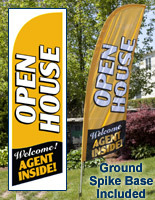 This open house message flag that includes a nylon bag allows realtors to keep all the components organized. There are separate slots in the bag for each section of the pole, as well as the ground spike and banner. The open house message flag with a nylon carrying case can be exhibited anywhere there is grass, as the unit includes a ground spike base. The banner connects to the pole with a cord to ensure the pennant stays securely on the pole in windy conditions. The introduction of this real estate blade banner now gives realtors an alternative to traditional yard signs for advertising properties and listings!